They have a longer life span as they're not open to the elements. They can be located out of sight in a loft space, roof void or chimney stack. They are easy p to maintain. There is no need for scaffolding / cherry picker at installation or maintenance. They are the ideal solution for listed buildings. The unit can be fitted both horizontally and vertically depending on space available. Can be installed in most accessible spaces for easy maintenance. The motor has a variable speed with a centrifugal rotor and secondary cooling impeller. The windings are class F, sealed, lubricated ball bearings. This ensures reliable operation for years to come. The 150 model has an approved fail-safe function. This curs off the gas supply should a fan failure of flue blockage occur. This complies with the Gas Appliance Directive 2009/142/EC. 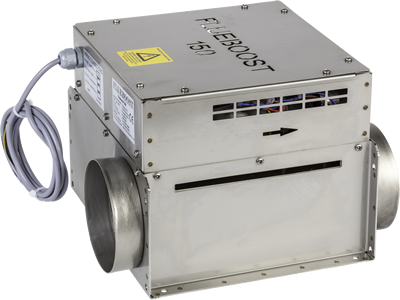 Please contact Flueboost if the unit is being installed with a sealed appliance. Varies with speed of fan. Details on request.